Karly’s wedding went off without a hitch. Everything looked amazing and in perfect bird theme, the food was yummy, the dancing was awesome and a good time was had by all. This is a picture of Jesse and I from the evening. Not the best picture of me in the world, but for those of you who are keeping score this is the other Lilly Allen dress I had shipped over from London. I wore the first one to Vickie’s wedding (and Friday night to the Tribeza fashion show for that matter) and the other one Saturday to Karly’s wedding. I wish I had a picture of my shoes to show you, I’m too lazy to go snap a quick picture. They were these Irregular Choice heels that I have had for 2 years and never had on my feet. I took them out and realized they matched the dress perfectly! They were green with a purple polka dotted bow over the toe and most importantly they have spurs. Yes spurs that clink when I walk and spin. I somehow amazingly danced the night away in them. My other favorite part of the wedding was the fun wooden picture cut out they had (Cory and Reynard are in the picture). Karly had a picture of her grandparents on their wedding day at a carnival or fair with their heads peaking through a wooden cutout of a married couple so Karly commissioned Hope to paint an updated version for everyone to take a picture in at the wedding. There was a Polaroid near by where you taped your picture in the wedding book and wrote a special note. Super duper cute! 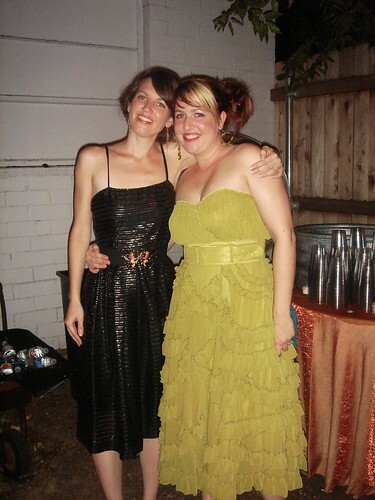 Posted September 24, 2007 & filed under Fashion, Friends. I love that cut out that is reflects back to generations before…now it’s a tradition!